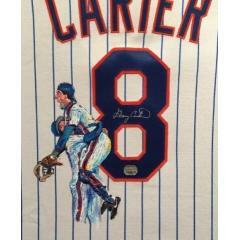 Through the vision and talent of noted sports artist Al Sorenson, Big Time Bats is proud to offer this truly unique hand-painted jerseys featuring the a celebration scene from the 1986 World Series featuring Gary Carter, as well as the Hall of Fame catcher's autograph. Sorenson captures the jubiblation of Carter immediately following the Mets' Game 7 series clinching victory. 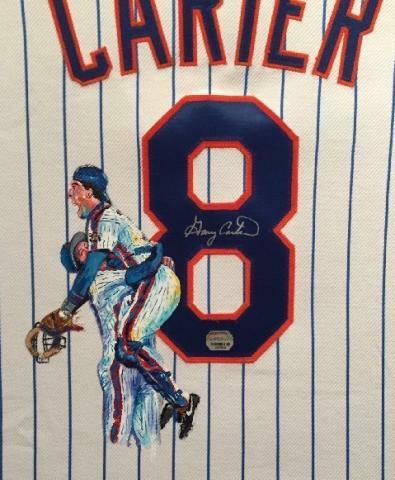 This jersey is an original piece of artwork that any NY Mets fan would love adding to their collection. The artwork includes the signature of artist Al Sorenson and authenticated by PSA/DNA. Get this original piece of amazing autographed art before it is gone..
Due to the limited nature of this offer we must charge your credit card for the full amount immediately upon taking your order. This policy ensures we reserve a jersey from the series for you. We will confirm your order by Email. The jerseys are not game worn. Please allow 2 to 4 weeks for delivery.